Yandex.Metrica is a web analytics service for sites. To work with Yandex.Metrica, you need to create a counter — a special code embedded on all site pages. It passes the information about the site, site events and users to the service. In Yandex.Metrica, you can set goals and segments. 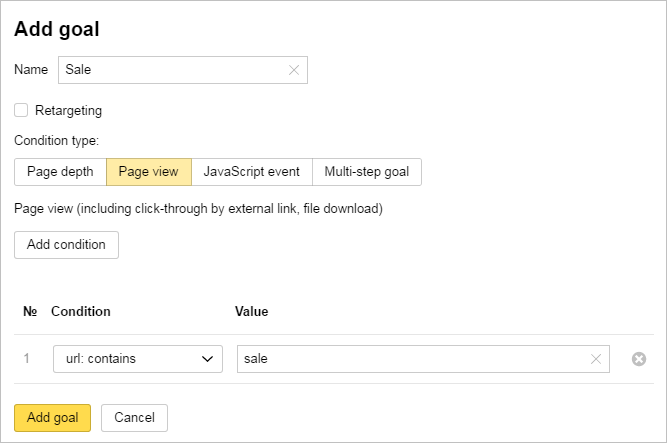 Use the goals to track specific user actions on your site. For example, when the user opens a promotion page, puts discounted items in the basket, or proceeds to check out. Segments describe the users' characteristics: how the user got to the site (from social networks or Yandex search), what device the user viewed the site on (a mobile phone or a desktop computer), and the gender and age of the user. In Yandex.Metrica, go to Settings → Goals and click Add goal. Enter the goal name and the conditions for completing it. This will enable you to create a segment based on traffic from social networks. 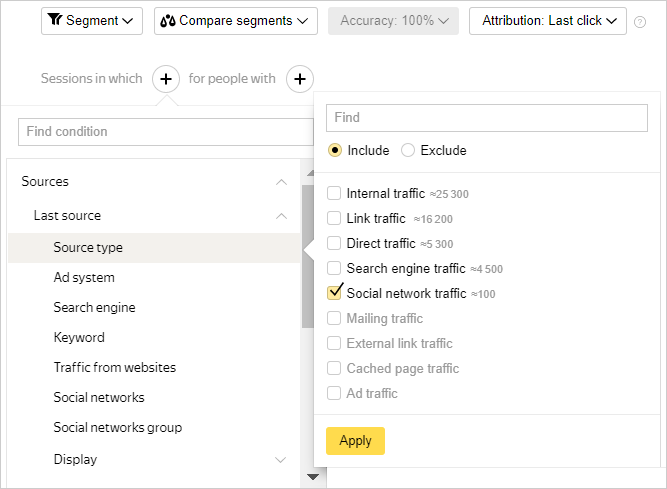 In Yandex.Metrica, go to any report and set filters for sessions and people. Click Segment → Save as and specify the name of the segment. You can create a segment in Yandex.Audience based on the data from your tag or from a tag you have editing guest access to. In the Segments tab, click the Create segment button and choose Based on Yandex data → Yandex.Metrica. Enter the name, the tag and the criteria for selecting users. Note that the segment is based on the data for the past 90 days. The created segment gets the “Processing” status. Processing can take up to two hours. If the audience coverage is at least 1,000 anonymous IDs, the segment gets the “Finished” status. You can now use it to configure your ads. If the access to the tag is cancelled or changed to read-only guest access, the segment gets the “Not active” status and the ads in it aren't shown.